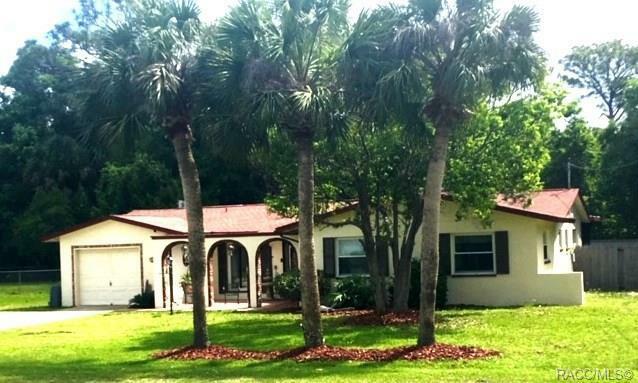 WITHIN THE SHADOW OF THE PLANTATION INN & GOLF COURSE, SITS THIS BEAUTIFULLY UPDATED 3 BED/2 BATH POOL HOME! Most furnishings stay w/right price, so it would be turn key for snowbirds or investors wanting rental income. Outside of the Crystal River city limits, so short term rental potential. Interior completely updated after Hermine. Kitchen glimmers w/stainless appliances, all wood cabinets, beautiful counter tops. Tile throughout home for beauty & ease. Large Master Ste w/entire wall of closets. Guest rooms are good sized so everyone is comfy. Liv. room, family room & Master Bedrm all open out to beautiful screened lanai & pool. Lanai & pool area was made for entertaining & runs entire span of the back of the house. Almost all windows & doors replaced w/double pane. Roof = 2006. Across the street from the Plantation Inn & Golf Course, so you are seconds from sports, dining, & entertainment. Convenient to all that Crystal River & the Nature Coast has to offer. Don't miss this one!